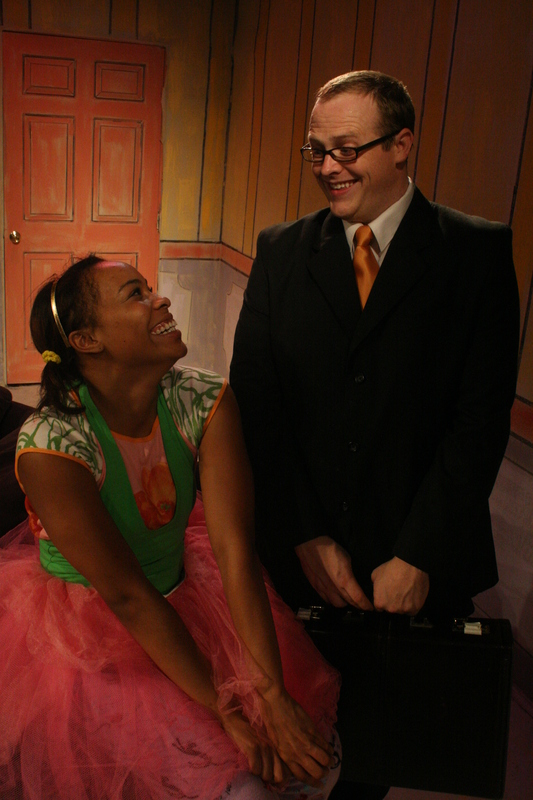 Capital T Theatre » Critics Meet Mr. Marmalade and Love Him! Critics love to hate Mr. Marmalade, and we couldn’t agree more. Do you think it is because the reviewers are afraid of Mr. Marmalade’s legendary quick temper and cutthroat business tactics? Or is it just because they really enjoyed the show? The creative team for this Capital T Theatre Company production seems fully aware of the darkness in Haidle’s comedy, but they bring to it a brightness that keeps the whole affair surprisingly light. Mark Pickell’s living-room set, with its flat, butcher-paper rug and walls outlined in thick, black marks and shaded in pastels, recalls a cheery coloring-book illustration. And Tiny Robinson’s Lucy seems just like the kid who colored it in; the actress – who is an adult – plays the child with the exuberance of a kindergartner set free at recess, all giddy, playful energy busting loose. By contrast, Chase Wooldridge’s Larry has that perpetually slump-shouldered, hangdog demeanor of Charlie Brown at his Charlie Browniest – and it inspires the same kind of comic sympathy one feels for the Peanuts hero. As the titular imaginary friend, David Bowers shifts skillfully from amiable playmate to manic bully, tempering Marmalade’s increasingly outrageous antics with just enough humanity to keep us watching him – and laughing.